Catch some backpackers around the campfire, and more than likely the libation they are sipping on is whiskey. Backpackers often favor whiskey because of the demands of hauling a camping kit miles into the wilderness on your back, which makes one very conscious of weight. A fifth of spirits weighs about three pounds, less than a six-pack while delivering more punch than beer. What’s more, vodka, gin and even rum don’t have the rugged personality to pair with roughing it, making whiskey the natural choice. Plus, you can use it to jump start a fire if you’re desperate. So, whiskey is the way to go when you’re camping, especially backcountry camping. Since you need to balance a flavorful pour with something that will fit nicely in your bear bag, these are the best whiskeys for camping. One way to go is the 375ml “pint” bottle. If your camping party is just two or three people, a half-sized bottle will do the job while greatly reducing size and weight. Moreover, many premiums brands are available in pint bottles, so you don’t need to cut quality while saving on weight. The only Kentucky bourbon made “Irish style”—triple distilled in copper pots—it’s a sweet, well-rounded and easy drinking bourbon. At 90.4 proof, it’s definitely the all-around middle of the road choice among the bourbons available in pint bottle size, straddling the center in terms of alcohol strength, flavor and cost. If you are looking for something a little less expensive and/or light enough that you can pass it around the campfire to even those who aren’t enthusiastic whiskey drinkers, Old Forester is the way to go. Going much cheaper than this puts you in the realm of the truly mass-market brands, while its 86 proof strikes a solid balance between not being too strong while staying flavorful. If you want to go big and ballsy, you can’t go wrong with Maker’s Mark Cask Strength. This is basically taking the wheated bourbon goodness of Maker’s and putting it on steroids, up to the middle 110s of proof. Best of all, when this expression was originally released, it was in the 375 ml size, so this is actually the original format. Although it’s not cheap, taking Blanton’s out in the woods certainly adds a degree of elevation to roughing it. The original single barrel bourbon is noted for its quality, and Blanton’s weighs in at a respectable 92 proof as well. Best of all, it comes in a small felt bag that you can turn around and use as a little ditty sack. If you are car camping, weight is no problem. But if you aren’t and you still need to haul a full fifth of whiskey into the bush, you can still shave some weight by getting a PET plastic, travel-safe bottle instead of a glass bottle. 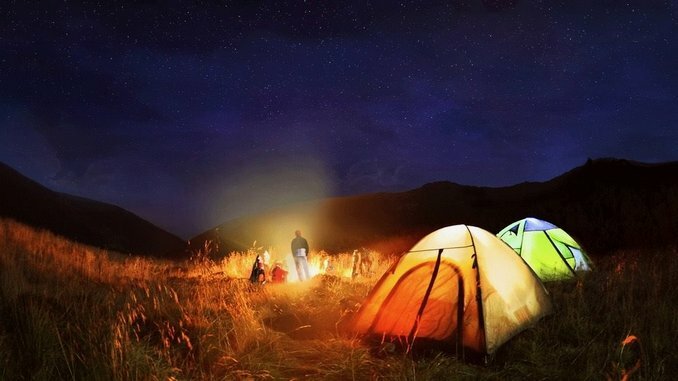 Seriously, what whiskey goes better with camping than Wild Turkey? The name pretty much says it all, but beyond that the flavor has a certain oak and cedar aspect that pairs marvelously with sleeping under the tree canopy. Finally, it comes at a very reasonably price for a 101-proof bourbon. Although you may want to get the most alcohol out of your whiskey for the least amount of weight, there is something to be said for easy drinking approachability, especially when ice cubes aren’t an option. And as previously noted, you may be passing the bottle around to someone who isn’t a whiskey-lover. Like Old Forester, it’s bottled at a very easy going 86 proof. An added selling point is that it’s about as cheap as you can get for a fifth of whiskey without reaching for rotgut. Richard Thomas turned his Kentucky upbringing and eight years as a European expat into cheese, whiskey and wine writing. Booze-wise, he owns and edits The Whiskey Reviewer and writes freelance, including authoring the book Port: Beginners Guide To Wine and contributing to The New Single Malt. When he isn’t scribbling in a bar, he is hauling a ruck in Red River Gorge.